September 11, 2001, I woke up to my clock radio at 8:08 a.m. Half asleep, I heard something about a plane crashing into a building. I mindlessly turned the radio off. I rolled over and fell back into the dream state. As I slept, people were dying in New York, being burned alive. America was under attack. We were under attack. When I woke up, on Good Morning America, smoke was billowing from lower Manhattan. Was it an accident? Was it intentional? Nobody knew. The imagery was horrific though. Humans throwing themselves out the window of a burning building. Live. In real time. And the billowing smoke. Would it choke us all? The sky was clear blue in Austin. I headed to UT for my 10:00 class: Advertising Portfolio I, in which a curmudgeonly sixty-something Madison Avenue vet-turned-professor ripped into the creative ad concepts we pinned to the wall, verbally if not literally. We fledgling copywriters and art directors would partner up, choose existing brands and products and create fake campaigns for them. We’d walk around, critiquing the mock ups and storyboards, then sit down and listen to the prof rant about each person’s work. Campus was eerily quiet. Even the towering Live Oaks seemed to be mourning. As I walked into the College of Communication, I saw a group of people riveted to the television bolted in the lobby. The buildings were still burning. I rode the elevator to the computer lab on the seventh floor. CNN was being projected onto the wall. The professor switched it to NBC for a clearer picture. And then, the second plane with the second suicidal megalomaniac onboard plowed into the second tower. There was a collective gasp. With the next in-breath, the world had changed irrevocably. Life as we knew it exploded with terror. I could not —still cannot — imagine the nightmare of that day and the days following the attack for the people who were in New York or Washington. I was not in shock; I was not panicking. I selfishly worried that a missile would fall out of the Texas sky and land on me, but I realized that was probably not going to happen. Still, the images on the screen were showing us this new reality. This was war. 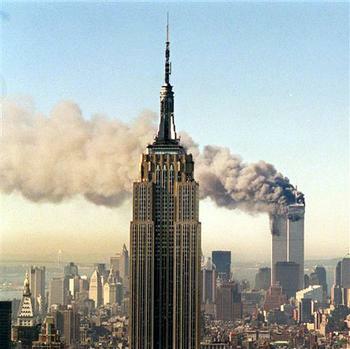 *Read the rest on Elephant Journal… 9/11/11: A reflection on terror and peace. Next Next post: The eight dazzling truths of yoga schmoga.